The "office supply guy" who visits my office weekly is the nicest older man. He's in his seventies, and we always end up chatting about something completely unrelated to work, like his grown kids or places we've visited. Recently he noticed a book on my desk and asked if I like to read. I said that I did, but that I never seemed to have enough time for it anymore, which is why I read on my lunch hour (or minute) every day. He asked if I ever thought about books on CD. I told him I'd thought about it but had never bought any. It turns out he's an avid book listener thanks to all the time he spends in his car, and after he listens to them, he lends them out. Was I interested in borrowing some? Hells yeah! 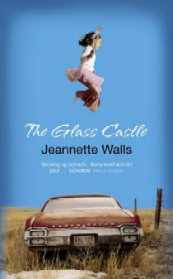 He brought me the first one last week -- "The Glass Castle." I was intrigued to see if I would enjoy hearing a book as much as I enjoy reading one, not to mention finding out if driving and listening would work for me. I drive a minimum of one hour each way to and from work, so that's at least two hours per day, assuming there isn't terrible traffic. I popped the first CD into the player and tuned in. What can I say? I'm hooked! I haven't listened to live radio (and their often annoying DJ's and commercials) in over a week, and I haven't missed it a bit. The drive breezed right by as I focused on the story, which in itself is incredibly emotional and heart wrenching, and I found myself wishing I wasn't almost home because I'd have to turn it off. What I love most is truly focusing on the story, and allowing myself to escape my own racing thoughts and worries for that hour. When I do get distracted, I skip back through the CD to where I was last listening, and re-focus. I don't want to miss a thing, and I'm sorry to say there are only two discs left. It's okay, though -- my supplier hooked me up nice office supply guy brought me another one today. "Three Cups of Tea." He said it inspired him greatly, and I'll be curious to see if I'll feel the same way. Until then, I can't wait to "hear" how this one ends. M and I and my hubby listen to books on CD on long trips, old radio shows too. It's pretty cool, and makes for a nice quiet trip! First of all... I loved The Glass Castle! My favorite book that I read last year! As for audiobooks. love them! I don't commute to work anymore, but I listen to them all day when I work at home. I listen to books in the car all the time! Our local library has tons of them, so I never even have to pay money for them. I am totally hooked on the author Mary Higgins Clark -- she writes mystery novels. Her daughter, Mary Jane Clark, is also pretty good. I've almost "read" everything our library has, though, so I'm always looking for a good suggestion. I'll definitely look for The Glass Castle the next time I go to the library! The Glass Castle is one of my favorite books ever. I think my copy is still being passed around! I have never done books on tape - then again I don't commute. I have a friend that has spends a lot of time on the road and gets in a lot of books this way. Sounds like a good plan to me.